Over the past few months I’ve been ridiculously busy with school (which means hardly any sewing) and suffering from hand/arm injuries (which means hardly any knitting), so I don’t even have that much to show for the time I’ve been gone. 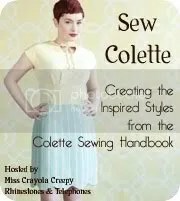 I just bought both the Colette Sewing Handbook and the Burdastyle Sewing handbook, and I can’t wait to start sewing from them. Hopefully I will have time to sew more than 1 garment a month, but this should be the least that I can do. I’ve got fabric set aside for a Meringue already, and at the end of the month I’m off to Paris, which should be the perfect place to find the fabrics for the other projects.